We’re so close, how can we not stop in New York city? After spending a few fun-filled days on a mooring at the 79th street boat basin during the summer we know it’s an opportunity not to me missed. This was actually a much more difficult decision than I make it out to be. 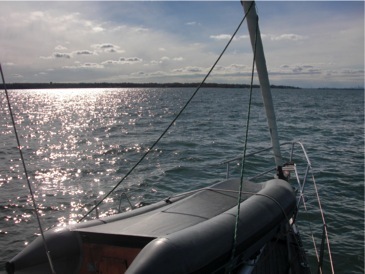 Pirat is currently moored in Manhasset bay, adjacent to Port Washington, NY on the south end of Long Island. We got here yesterday afternoon after a fabulous sail from Stratford (15-20 knots on a beam reach, Pirat screaming along at almost 9 knots with the current). We stopped here last time we went down the sound too, so we knew right where to look for the FREE town moorings. The next step in the plan was to head through Hell’s Gate, cross NY harbor, and anchor in Sandy Hook, NJ. Looking at the weather, conditions won’t be good for a jump down the Jersey coast until the middle of the week at least. That means we’d be sitting in Sandy Hook with a strong North wind howling into an anchorage that’s totally unprotected from that direction – not a very appealing scenario. Our options? Stay in Manhasset bay – the mooring is free, we know where to finangle showers, and there’s a cool little Greek cafe/market with wifi. The problem with this plan is it puts us on the wrong side of Hells Gate should the conditions change and we want to head south sooner. We’d also have to go through the city during the winter norther that arrives tomorrow. Just going to Sandy Hook and dealing with the wind is another option. Our third option is to turn right up the Hudson after riding the current through Hells Gate and pick up a mooring at the boat basin. That would put us in a secure, sheltered location next to Riverside park, a subway station, several cool NY markets, and the incredibly disgusting shower in the little marina. After lots of back and forth we opted for option three this morning. An increase in the forecast wind at Sandy Hook put us over the edge. Lee and I are having a relaxing morning, enjoying the time change, and catching up on down time. Lee is messing with the wind generator, which seems to be permanently burned out. He was going to give it another chance but it’s not producing any voltage so we just took it down. Frankly, we need power. Since the fuse blew during our Death Sail last week, we haven’t had solar or wind power. We’ve had to run the engine instead. Just the solar panel, which is reconnected now, makes quite a difference but we could still use more. Lee’s parents drove down to visit Lee’s grandmother this weekend and met up with us on Friday night. They brought Lee rubber boots like mine and some extra pairs of yellow gloves for both of us from Hamilton Marine. They also brought our mail and my bag of winter clothes so I could pull out a few supplementary items – fleece tights, long underwear bottoms, and another fleece top. We all went out for a tasty but late dinner and then made a grocery run. We can’t have Lee’s parents follow us all the way down the coast so this was our last rendezvous. What would we do without all their help?! The same goes for Conor and Kristen. It was great to see them again and sooooo nice to have a warm, dry place to hang out while it rained. Showers, laundry, and powerful internet are luxury items that we really, really appreciate when we can get them. The only unfortunate result of visiting our Stratford friends is that I left both my pairs of Smartwool socks on the drying rack in their basement. They just weren’t quite dry and I knew I’d forget them but I hung them up anyway. Oh well. I bet I can get some warm socks in New York. I’m reading Ingrid Betancourt’s memoirs about being held hostage by the FARC for 6 years in the jungle. I’m sure it’ll certainly help you love boat life even more. I think you’d like it. You should be able to find it in any bookstore– it just came out.